Why not begin with a short slideshow on the native beauty of the Thousand Islands? Download it Here. Right-click and choose “Save Target As” and save it to your computer. It is an executable (.exe) file so you might get a warning but it’s safe. To play it double-click and then press the inset image to play. Press escape to end and escape again to exit. File size is 4.79 megs. Then read below for more information about non-natives and the damage they do to our resources. 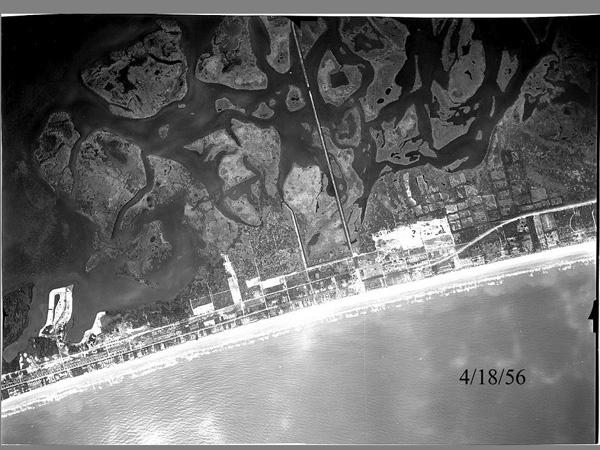 In this slide we see an aerial view of Cocoa Beach and the Thousand Islands in April of 1956, before any significant dredging had been done. 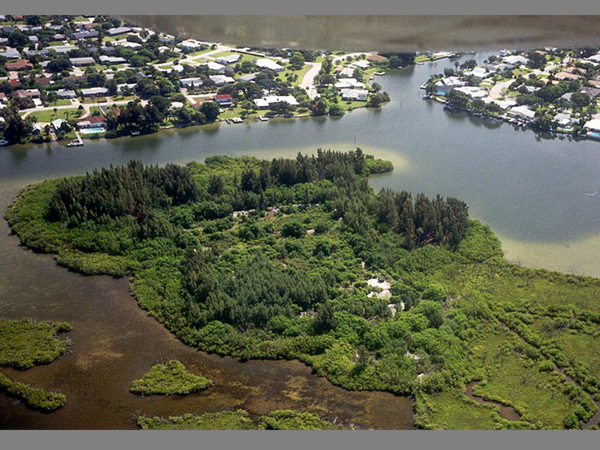 Some of these changes are the result of efforts to control saltmarsh mosquitoes in the late 1950’s through the early 1970’s. The saltmarsh mosquito doesn’t lay its eggs in standing water; this is a defense mechanism against predators. These mosquitoes lay their eggs in mud or moist sand, waiting for rains to come and raise the lagoon levels to flood the sand or mud, allowing the larvae to mature before predators such as the mosquito fish can eat them. In source reduction the ability of the salt marsh to produce mosquitoes is decreased by reducing the habitat that the mosquitoes need to breed in. In the slide below we see a fairly large pond with an area of bare sand to the upper left. Although this is actually a spoil pile it illustrates the bare areas much like this that are the sort of breeding habitat that mosquitoes use. When the water level rises as the summer rains begin, water floods the bare sand, the eggs hatch and the larvae are able to mature and hatch out. The idea behind source reduction is to take away that habitat that mosquitoes need to breed in. 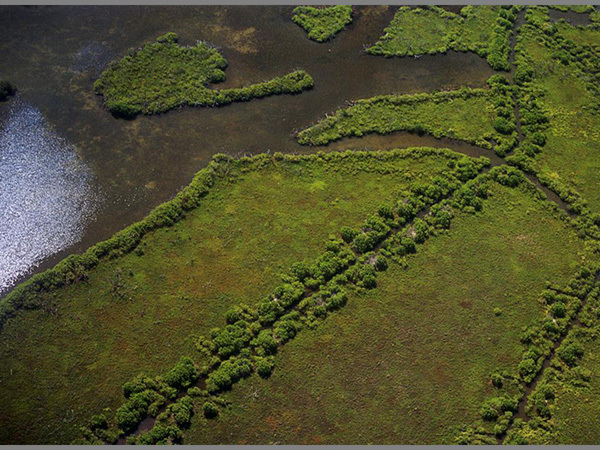 In the next slide we see an area of salt marsh that has had small straight ditches dug through it to allow mosquito fish access to the interior parts of the marsh during low water so they can eat the larvae when they hatch. This method was not as effective as people had hoped it would be. 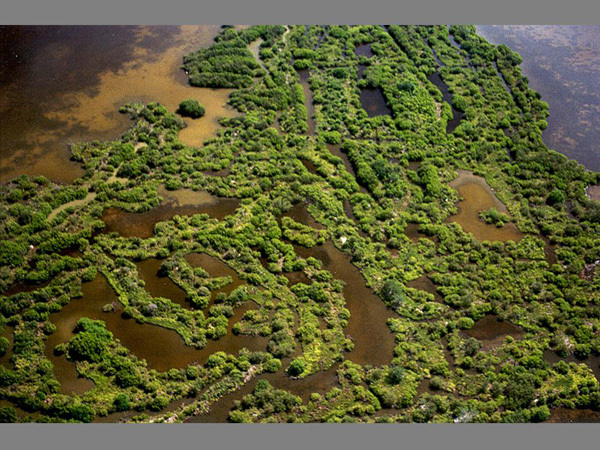 The only effect on the environment was to allow mangroves to disperse to the interior of the marsh and you can see them along the sides of the ditches. 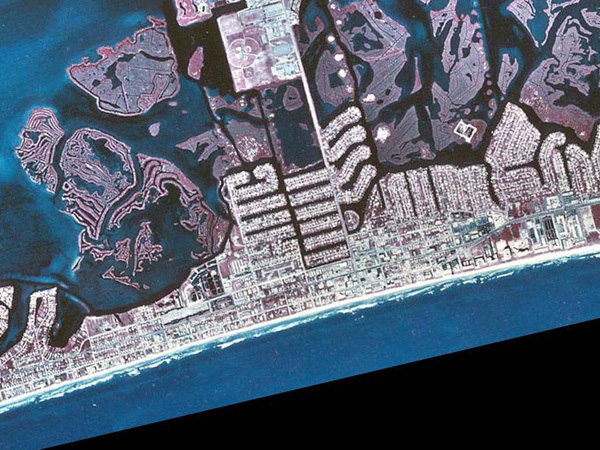 The next step, begun in the mid 1960s was to simply remove this sometimes wet, sometimes dry salt marsh, replacing it with either water or uplands. The result of dredging these mosquito canals can be seen in the next slide. There is almost no wetland vegetation remaining, it has been replaced by upland plants on top of the dredge spoil. 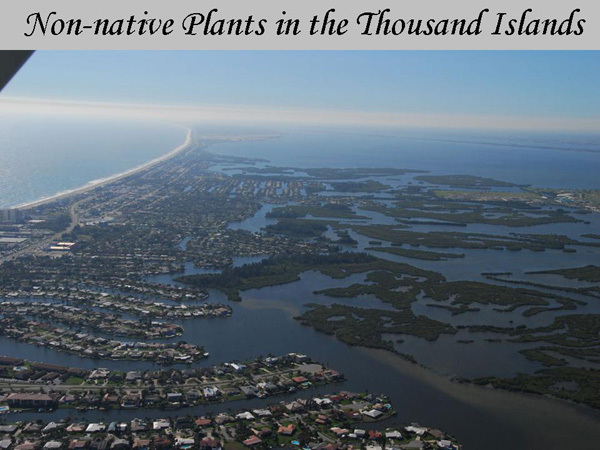 When these upland areas were created, they were quickly colonized by plants known as pioneer species such as Florida privet, salt myrtle, Brazilian pepper, and Australian pine. 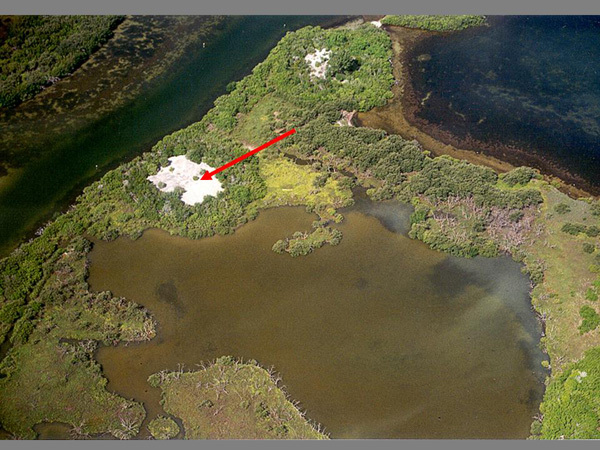 In the aerial view of a dredge spoil disposal site above, we can see the Brazilian pepper and Australian pine, in stark contrast to the native species in the minimally altered salt marsh to the lower right portion of the photograph. Disturbed areas such as this are very susceptible to invasion by these non-native pest pants.